One day the hex bolts that held my multi-tool together started to work loose and I realized that to tighten them I would need another multi-tool. I have been collecting multi-tools ever since. A tool for every occasion. This is my go to multi-tool when i am working on my bike at home. 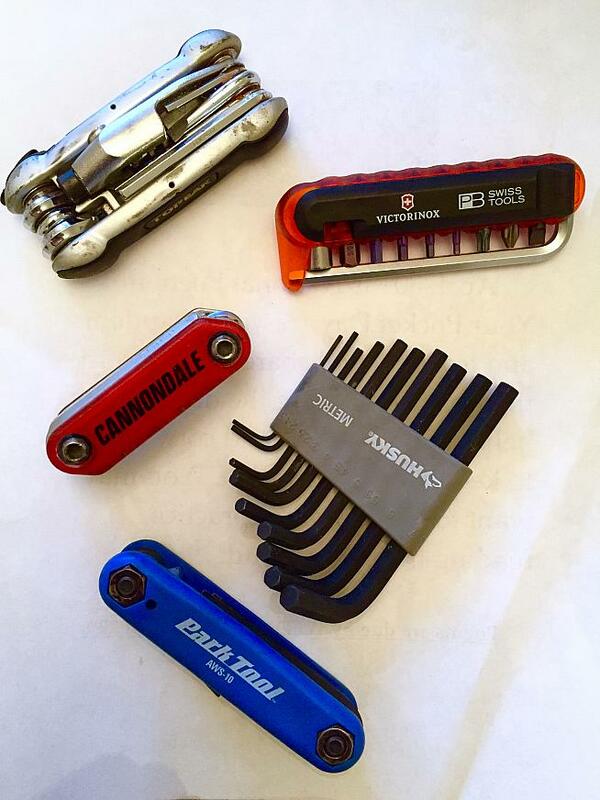 A set of seven bomb proof hex wrenches wrapped in the inimitable blue park tool cladding. This multi-tool makes me feel like a real bike mechanic whenever I'm using it. It doesn't usually go out on rides though - we'll come to that multi-tool later. This is my oldest multi-tool and the one with the wonky hex bolts. I like it because it also has a flat head and a phillips screwdriver. For that reason it has found a semi-permanent home in my tool box for doing odd jobs about the house and rarely gets to work on bikes anymore. Not strictly a multi-tool but worth a mention anyway. Like odd socks and favorite T-shirts these little guys have the ability to appear and disappear at will and the one you want is never there when you need it. I have at least three sets of these in varying states of disarray. All of them are metric. Victorinox (the Swiss penknife people). Either this is not a good multi-tool or I'm a very stupid person, or both. The hex ends are interchangeable and I can never figure out how it's all supposed to fit together and then how it's supposed to fold away again. I only use this one when I can't find any of my other multi-tools. Fortunately this isn't very often. This multi-tool is larger and slightly more fiddly than both the Park tool and the Cannondale but nevertheless this is the one I take with me when I'm out riding. As well as the hex wrenches and screwdriver heads it has spoke keys, detachable cladding that doubles as tire levers, and a chain breaker. It's this last feature that earns it pride of place in my saddle pouch. Ever snapped a chain in the middle of winter and had to wait an hour in the freezing cold for a ride home because your multi-tool didn't have a chain breaker? I'm still looking for the ultimate multi-tool so if you have any suggests please let me know.